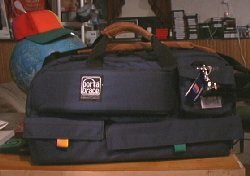 Anyone that has worked in the broadcast world is familar with cases from PortaBrace. The Vermont-based company makes fitted covers, raincoats and transports for almost every camera, videotape deck, monitor and doo-dad known to mankind. And in what could be a nod to Henry (any color as long as it�s black) Ford, you�ll always know PortaBrace by their distinctive navy blue color. They are unfailingly well-designed, tough, and comfortable to use. As an owner of a new Canon XL1, I knew I was going to need a carrying case. Since the camera�s design is brand-new, there weren�t any specifically-built cases at first. I looked at various generic bags, but none of them could quite fill the bill. None of the other companies in the field, like Kangaroo or Kata, had anything out for the XL1, and the Canon HC-3000 "big silver box" is heavy, not usable as a commercial airline carry-on, and seems to have "steal me" written all over it. Calls to the North Bennington headquarters of PortaBrace�s parent company K&H Products let me know that there would be a few months delay in delivery. I called my dealer in Milwaukee to see if he could put on a little pressure to get me one of the first units. I have no idea what he did, but my new CTC-2 case showed up on my doorstep the day before I left for Florida on a shoot. On first examination, you say "Hey! It�s a PortaBrace!" And it is. The familiar color, the well-shaped semi-rigid design, the copious pockets and the supplied white-balance card are all familiar. The CTC-2 has one top-mounted zipper, which unzips in both directions to make the case open from the top like a clamshell. 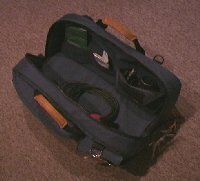 There are three external pockets on the front side of the case, two horizontally along the bottom side large enough for a mike & cable, a cell phone, a handful of XL1 batteries, or about 30 mini-DV tapes. A third pocket halfway up the side is large enough to hold the standard battery charger or a compact set of headphones. A nice added touch is the clear plastic pocket on the outside of this pocket - perfect for holding a supply of business cards. On the back side there are two mesh pockets, each large enough to hold a magazine or the white balance card. Larger PortaBrace cases have an aluminum guard that protects the viewfinder on the Betacam inside. The CTC-2 goes this detail one better with a semi-rigid plastic guard that is sewn right into a "well" that allows the case to close over the viewfinder of the XL1 and keep it from getting banged around. When the case is zipped closed, you see nothing of the camera - and anonymity can be a very good thing in a busy airport. Inside the case you�ll find 3 more pockets. The largest of the three can easily hold three XL1 batteries, and the smaller two are patch pockets that can hold paperwork, AA batteries, or any of the other dozens of items we bring on shoots. The handles are nylon covered in leather for comfort, and the case comes with a leather-covered, padded shoulder strap for hands-free hauling. In my real-world travel test, I took the CTC-2 and my XL1 onboard a BAE-146 commuter jet, an MD-80, a Boeing 757, and a DC-10. In all cases the bag fit comfortably in both the overhead storage and under the seat. Aboard the MD-80, it fits in the overhead bin fine, but it's a little long for under the seat (however, it's OK sideways...if your seatmate doesn't mind.) Same for the ATR-42. This airplane has the tiniest seats imaginable! The side mesh pockets are useful for carrying your ticket and a little extra reading material. I wouldn�t recommend anyone stack anything heavier than a coat on top of the bag, though... it is only semi-rigid, after all. All of this capability doesn�t come for free. I paid almost $240 for the CTC-2, but I know I have purchased a tool that will protect my XL1 for a long time to come. Even a blind pig can find an acorn once in awhile.